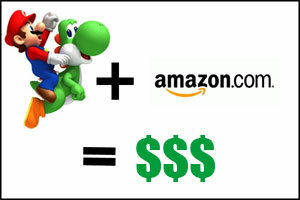 Just a heads up for potential New Super Mario Bros. Wii buyers: Amazon.com currently has a deal where you get a $10 coupon for ordering the game, similar to what they were doing last week. The $10 promotion will be applied to your account 2 business days after the game ships. Mario, Luigi and two Toads are all playable characters, while many others from the Mushroom Kingdom make appearances throughout the game. Players can even ride different Yoshi characters and use their tongues to swallow enemies, items and even balls of fire. In some areas, players use the motion abilities of the Wii Remote™ controller. The first player to reach a seesaw might make it tilt to help his or her character reach a higher platform – or might maike it tilt incorrectly just to mess with other players. This is the first promotion I’ve come across regarding the game, if anything else comes up we’ll be sure to let you know. The Amazon deal can be found here.